HMLF: I cannot answer for Mary J. Blige except to say that when a person is famous or well-known, sometimes they will give such person “executive producer status” to add to the strength of the film. Mary J. Blige is my friend! And nothing that’s in this movie has diminished my love and respect for her. In two years, it will be 50 years since the assassination of Brother Malcolm: At no time during these 48 years has the government opened the files on that murder of Brother Malcolm, and let the public see those files. I have appealed to the government to open the files, so that everything in those files could be made manifest, not only to the Shabazz family, and the families of those so ill-affected by his murder—but also my family, and the lives that are constantly put in the public. HMLF: I did not kill Malcolm X. Before too long, you will really find who is “exposed”—and it is those who want to put on me what no court, no judge, no jury, could put on me. And if my enemies had a chance to bring me before the courts, and put me in prison for such a crime, they would have done it a long time ago! No, I am not “exposed”. But the wickedness of those behind my slander will be thoroughly exposed! HMLF: I am not guilty of killing Malcolm X. What I said on 60 Minutes was extracted from a 4-hour interview with Mike Wallace and Attallah Shabazz. 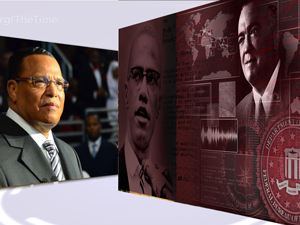 When I stood up to defend the Honorable Elijah Muhammad against what Brother Malcolm was saying, I spoke into an atmosphere exploited by the F.B.I. The word that I used was “complicit”, but complicit in that my defense of the Honorable Elijah Muhammad was manipulated by The Enemy to provide the context of his assassination. HMLF: Again, the scriptures teach: “You shall know the Truth, and it will set you free”—and it will stop the confusion. So I’m obligated to answer these false charges with The Truth, so stay tuned. HMLF: To this detractor: I am happy that you are aware that this movie is about Farrakhan and not about what it purports to be. This movie is not exposing who I really am, it is an attempt to destroy the good reputation I have with the people who love and admire me. You keep watching! And see if you will hold on to that same opinion when you come into the knowledge of the real truth of “what was said,” “what was done,” and “who is behind the film” and their motivation. HMLF: To those who are predisposed to believe that what you saw in the movie Betty & Coretta is “absolute truth”: The government has refused to release my file, though my lawyers have been attempting to obtain it for years under the Freedom of Information Act. They will not release it. Clearly they are hiding something. The Jewish people behind this film have characterized Farrakhan as the “No. 1 Anti-Semite.” That was the title they gave Brother Malcolm while he was alive; now, they’ve given it to me. I am not guilty of killing Malcolm X. If I were, I would have been brought into a court of law and sent to prison. Those who control this movie, those who wrote the script—those who control the media—all want to try me in the court of public opinion. Why do they want to try me in the court of public opinion? Because in a court of law, facts would have to be produced. So the only thing they can do is try me in the public. And those of you who are predisposed to believe what they are saying: You will be duped by what they say! But The Truth will come out—and we intend to make it known! And then you can choose whatever side you wish to be on.